The humpback whale is known for their long migration journeys each winter, putting on a magnificent display of breaching, tail slapping and spy hopping as they make their way to warmer waters. South-East Queensland is one of the best places to view these amazing creatures, with up to 33,000 whales expected to journey past Moreton Island this winter. This is definitely something you don't want to miss! Tangalooma operates daily whale watching cruises from June through until the end of October with departures available from Brisbane and Tangalooma. Board the largest dedicated whale watching vessel in Australia and see these majestic humpback whales in their natural environment as part of an awe-inspiring day tour. The cruise includes a light lunch onboard as well an extensive educational commentary by an Eco Ranger from Tangalooma's Marine Education and Conservation Centre (TMECC). Departing from Brisbane at either 7am or 10am, you will enjoy a leisurely cruise across Moreton Bay. After a brief stopover at Tangalooma Island Resort, you will journey out to the northern tip of the island in search of whales. You also might be lucky enough to see dolphins, turtles and a number of sea birds as part of the cruise. 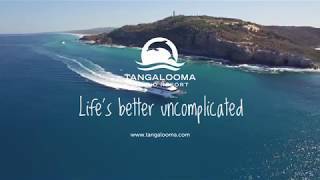 Educational commentary is provided throughout by Tangalooma's Eco Rangers from the Tangalooma Marine Education and Conservation Centre (TMECC). Prior to returning to Brisbane, day guests will have the opportunity to visit the resort and TMECC where additional information on Moreton Bay marine life, including whales and dolphins, is available. A light lunch is served onboard as part of this cruise. A light lunch is served on-board as part of this cruise. Join their local Eco Rangers at dusk to hand feed a member of the wild dolphin family. This experience is undoubtedly the highlight of any visit to Tangalooma. And be sure to smile, as our photographers are there to capture your perfect day out!